It seems that almost every golfer has a hard luck tale to recount about a prize that they would have won, had they not been disqualified for a mistake concerning their score card. Of course, there is no requirement to complete a score card in match play, so the following only applies to stroke play situations. Rule 6-6 and the Decisions thereon contain most of the important information concerning the score card. It is the Committee’s responsibility to provide each competitor with a score card containing the date and the competitor's name or, in foursomes or four-balls, the competitors' names (Rule 33-5). The competitor must ensure that their handicap is recorded on his score card. If there is no handicap on the card before it is returned to the Committee following completion of the players’ round, or if the recorded handicap is higher than that to which they are entitled and this affects the number of strokes received, they are disqualified (Rule 6-2b). If they enter a handicap that is lower than that to which they are entitled the Committee will use that handicap to calculate their score. Note that the Rules require the full handicap to be shown on the card, notwithstanding the number of holes in the stipulated round or the competition format (e.g. four-balls are often played at ¾ handicap). Decision 6-2b/0.5 makes this clear. The player should hand their card to their marker at the beginning of the round and after each hole the marker should check the score with the competitor and record it. Before the card is returned to the designated area (e.g. in a scorer’s tent, the golf shop, or a competition box) the player must ensure that the gross scores for each hole are accurately recorded and the card has been signed by both the player and their marker. If a score lower than the actual score on any hole is returned, the player incurs the penalty of disqualification. However, if a score higher than the actual score is recorded, that score stands. Only the marker and one player in a side have to sign the card. Full signatures are not mandatory, initials are acceptable. The marker and player may sign anywhere on the card, although obviously it helps the scorer if they sign in the correct spaces. A different card from the one issued may be returned (e.g. when the original card has been saturated by rain). No initials are required for alterations made to the card. The signature confirms all changes made. It is not necessary to calculate the points scored in a Stableford competition as this is the responsibility of the Committee, as is the totalling of the gross scores for each hole and the application of the handicap. However, as someone who regularly checks competition cards at my club, I urge you to do so; it makes life so much easier for us scorers. Surprisingly, there is no Rule making it mandatory for the competition date to be recorded on the card, but I recommend that it is, to avoid confusion. A card may be marked by more than one person provided that each signs for the part of the round for which they are responsible. The card must be signed by both the marker and player after the round has been completed. Note that a Committee may not, as a condition of competition, require that competitors must enter their scores into a computer and so players cannot be penalised for failing to do so (Decision 6-6b/8). However, a Committee may introduce a ‘club regulation’ to this effect and provide disciplinary sanctions, such as ineligibility to play in the next club competition, for failure to enter scores in a computer provided for this purpose. Can you clarify, if it is a scratch competition does a player still have to record his handicap on the card? No he does not. Rule 6-2b only requires that a player enters his handicap in any round of a handicap competition. A literal interpretation of Rule 6-2b is that the player's full handicap is required on the score card for any round of a handicap competition. However, in my opinion, a Committee would be fully justified in awarding the prize for the best gross score to a player, even though he had omitted his handicap from his score card. Strictly speaking, Rule 6-6 requires that the player signs the score card himself and returns it to the Committee as soon as possible. Decision 6-6b/6 rules that if a marker disappears before signing a player's score card the Committee should make every effort to reach them, but if unsuccessful, they should accept certification of the score by someone else who witnessed the round. In the circumstances that you describe, where your marker handed in your score card before you had a chance to sign it, the Committee should have made an effort to find you. As they did not and they were prepared to accept the card attested by a fellow competitor, their decision was final and your score stands.
. When playing a competition, is it essential that your card is signed by a player with an official handicap? Can it simply be marked by a member of the club in which it is played? A 'marker’ is one who is appointed by the Committee to record a competitor’s score in stroke play. He may be a fellow-competitor. He is not a referee. So, it is up to the Committee to decide who may mark a card in any competition. In my experience it is usual to require that the marker has an official handicap, but that is not a Rule of Golf. We were playing a regular 4bbb. I did not realise I had a stroke on the 5th hole and that my 4 had halved with an opponents 3. We had both holed out our putts, no gimmees. On reviewing the scorecard on the 9th I noticed this and asked for a half retrospectively and asked for the score to be adjusted. As my opponents (friends) were upset I gave them the offer to instead let me have a stroke on the toughest subsequent hole. Was I a) correct and b) reasonable in my request to adjust the score ? Providing the players correctly determined from one another their respective handicaps before starting the match, as required by Rule 6-2a, then the result for the hole should stand. It is the player’s responsibility to know the holes at which handicap strokes are to be given or received. Having said that, there is nothing to stop the players agreeing to adjust the state of their match regardless, as no other competitor's rights are involved. When you say a handicap must be recorded on the card. I take it below your gross score where you subtract it is fine. It doesn't have to be at the top as well. Yes, providing it is obvious that the correct gross handicap has been entered on the score card, it does not necessarily have to be in the space provided. I am the handicapper and match secretary for a small group of older players within our golf club. In our own group competitions, many mistakes are made on scorecards, but we try to fix them on the spot, no DQs. Some players do not record their own score under Marker's Score. I cannot find anything in the rules which requires the marker to keep their own score as well as the player's score. However, having 2 versions of the scores is essential to enable cross-checking. Can markers be forced to record their own scores? The Rules do not make it mandatory for a player to record their own score an a marker's score column, although it obviously good practice to do do. The Committee could impose a sanction on those players that do not record their own score, such as not being permitted to enter the next competition, but in my opinion this should be a last resort after gentler persuasion has failed. As you probably know, an incorrect score card may be corrected right up until the player leaves the scoring area, which should be defined by the Committee, (e.g. as soon as the signed score card has been dropped into a competition box provided for the completed score cards). The Rules require your marker to enter your score for each hole. Everything that I read assumes that score means gross, but I do not see that anywhere in the Rules? We play only 3 Stableford comps each year and many record only their points, which they argue is their score because it is Stableford. I want to insist that gross & points are recorded. Can I so insist? The marker is responsible for marking only the gross number of strokes for each hole where the competitor makes a net score equal to or less than the fixed score. The Committee is responsible for the addition of scores and application of the handicap recorded on the score card – see Rule 33-5. In a 4BBB competition one of the pairings didn't show for their tee time leaving a pairing to mark their own card as there was no marker available. Is this covered by the Rules of Golf? Can the competition committee agree to accept the score? There is no exception in the Rules of Golf that deals with the situation that you describe. Rule 6-6 requires that a marker signs the 4BBB competitors' score card before it is returned. Players may not mark their own score card. In my opinion, it would be wrong for the Competition Committee to accept a score that has not been attested by a marker, as it would affect the rights of all the other competitors. Quick query for you ,I play in a golf society .. Obviously if someone signs there card that has been marked wrong by there marker !! they are disqualified yeah ?? they need to check the card and correct any queries before they sign it and hand it in ?? . Can after , the card has been signed and handed in - the scores on the card be changed when the player/marker is queried on something .. ie he realises after it is handed in that he has had a 4 instead of a 5 and would get an extra point for the mistake when a 5 was marked down on the card ?? is this just down to local rules in the society or what should happen ?? No alteration may be made on a score card after the competitor has returned it to the Committee (i.e.handed it in), Rule 6-6c. If a score higher than the actual score is recorded, that score stands, Rule 6-6d. Thanks for the reply .. Just so I get it right .. If the card is marked and signed for say 35pts ... and then checked by the handicap secretary and he gets 37pts - the 37pts stand ?? yeah . So if he signed for 35pts and he actually only has 33pts ? does the 33pts stand ?? or at that point is he disqualified for not having a correct card ? Forget the points scored, as they are the Committee's responsibility and not the players (though players should assist the Committee by working out the points that they scored). 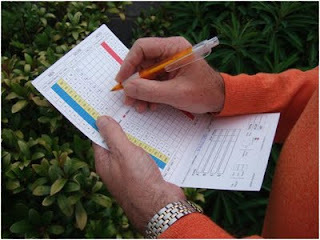 The Committee must only work on the gross scores for each hole recorded and signed for by the player and their marker. If a score was recorded that was higher than actually scored the Committee must accept that score. If a score was recorded that was lower than actually score the player must be disqualified. You should not have been disqualified,as your name was on the score card, in the form of your signature. In stroke play, the Committee must provide each competitor with a score card containing the date and the competitor’s name or, in foursome or four-ball stroke play, the competitors’ names. I have just played in a pairs competition were top 10 qualify for next round, could you please clarify if it is allowed for a signed scorecard to be returned to the player and altered to better his score? We were in the top 10 until this point, after the changes they qualified and we finished 11th. I am afraid that there is not enough detail in your question for me to give you a ruling. Rule 6-6c prohibits alterations to the score card "after the competitor has returned it to the Committee." Decision 6-6c/1 clarifies when the score card is considered returned, which varies depending on the nature of the competition. For example, the Committee may require a competitor to return their score card by placing it in a box and thus consider it returned when it is dropped into the box, even if they have not left the scoring area. Some players at our Club do not give their scorecard to a fellow competitor to be marked. Instead they record their own score on their card and that of their "marker". An opinion was given by a member of our District Referees Association that this was within the Rules, as there was nothing in the Rules that required a marker to record a player's scores on the player's scorecard. It seems to me this advice is contrary to Rule 6-6a, what do you think? The opinion that you received is correct. The Rules only require that the player and their marker both sign the score card before it is returned. However, marking one's own score card is against the spirit of Rule 6-6 and, in my opinion, Committee's should make it a Condition of Competition that the score card is kept by the marker and impose sanctions (e.g. suspension from the next one or more competitions) if this is not adhered to. I play in small club where there are approx 30 players in a medal. My wife works weekends. I was wondering if my 9 year daughter could mark my card? She is a junior member. I think it's up to the competition committee at the club but is there any precidents? There is no requirement in the Rules of Golf regarding the qualifications of a marker, so this is purely a question for Committees to decide in the Conditions of Competition. I am aware that some clubs permit anyone with an official handicap to mark cards for competition purposes. During a recent round of golf, the marker and I agreed to a final score and both signed the scorecard. One of the other players asked me my score and said that he had a higher score than the one shown. I was unaware he was keeping my score and we had not divulged scores to each other at any part of the game. Nonetheless, I handed him my scorecard and said that he must of made a mistake and he can go through it with my marker. I had to leave. The other player had then convinced my marker that two of the holes were incorrectly marked, changed my card and then proceeded to the pro shop with my card and had me disqualified. Given that the card was changed prior to handing in, were they right in disqualifying me despite the fact that I feel their behavior to be unethical. I am not going to get drawn into the ethics of the situation, but under the Rules of Golf, your score card was not properly returned to the Committee, as the marker had signed for a different score than you had signed for, making it ineligible. Not so much a disqualification as a 'no-return' for the competition purposes. they do not mark a playing companion's card so comparison can be made at the end of the round.Apparently the TV telecast is the double check. After each hole the marker should check the score with the competitor and record it. On completion of the round the marker must sign the score card and hand it to the competitor. The fellow competitor was very adamant that pros only kept their own card, DID NOT mark their fellow competitor's card AND the scores as shown on TV telecast were the check. I thought that sounded a bit strange and couldn't understand why a pro couldn't manage to keep his own score as well as his fellow competitor! Barry, fellow MGC member, i thoroughly enjoy you site. Handicap issue. if your handicap is 11 and you are playing in a fourball competition (3/4 Hcap) 14 holes (14/18 Hcap). So depending on whether you multiply by 14/18 or 3/4 1st determines whether my allowance is 6 or 7! typically the card that we use does 14/18 1st followed by 3/4. So, 6 is the mathematically correct handicap and therefore the first formula should be used. I realise that my previous answer was a bit glib, because it did not take into account the rounding-up, which is how golf handicaps work, when playing in four-balls, off 3/4 handicap, or on shortened courses. So, I have given this some thought and my conclusion is that the 14/18ths handicap should be worked out first, as singles competitions only have to make this calculation, according to the number of holes in the stipulated round. Then, for four-ball competitions, the 3/4 calculation should be made on the rounded amount after the 14/18ths calculation (.5 rounded up). I have checked the calculations for all handicaps to 28 and it works in favour of 11 handicappers by one stroke, and against 25 and 26 handicappers, by one stroke. Ironically, this makes a fallacy of my original answer, so my apologies! Yes, there is nothing in the Rules that prevents a Committee from gathering all available evidence to attest the accuracy of a player's score card that they have signed and returned. if you break standard scratch but your card is disqualified you are still cut in the competition. If you don't break standard scratch and your card is disqualified you are deleted from the competition and receive no point 1.is this correct or should all cards be left in the competition but just disqualified. This is not a Rules question. Unlike the Rules of Golf, handicapping systems vary greatly across the world and I have no expertise in this area. You should check the manual of the handicapping system for your country. Yes, Decision 6-2b/4 confirms that in a stroke-play foursome competition both players are required to record their individual handicaps on the score card. If only the combined handicap allowance is recorded the players are disqualified for a breach of Rule 6-2b. Recently playing in a stableford format, 3 guests and a member of our society entered all the scores on one players card and then transcribed them to the three other cards when they came into the clubhouse. Is this against any of the rules of golf? Decision 6-6a/7 confirms that competitors may return score cards different from the ones issued to them by the Committee, providing all the other requirements are fulfilled. There is no restriction to scores being transcribed from one card to another. Barry the correct scores for each of the holes in medal play were put in, but my marker and I for some strange reason added the total up wrong getting a higher gross score, the computor was not available to input in which would have highlightd this before handing the card in so left in pro shop box for later inputting by the pro, will this disqualify me. You incur no penalty for incorrectly totalling your score card, providing the gross scores for each hole were correct. In stroke play, the Committee is responsible for the addition of scores and application of the handicap recorded on the score card, Rule 33-5. A situation has been presented to me where a lady member playing in her ladies competition wants to play in the same group as her husband while he plays in his men's competition. My question is are they allowed to 'mark' each others cards considering they are playing in different competitions? There is nothing in the Rules of Golf that prohibits this practice, so it is permitted, providing the Committee approves and there is no a Condition of Competition that prevents it. Two friends of mine played in a pairs competition and won, however they were later disqualified as the low handicapper had put himself as player B and the higher handicap player (his partner) as player A. This seems ridiculous! Have the committee made a mistake? I am not sure that I understand your question. There is no requirement in the Rules that a lower handicap player has to be player A and the higher handicapper player B. However, the gross score for each hole must be attributed to the correct player by their marker. Any error in this respect should obviously have been corrected by the either of the two players and their marker before the signed score card was returned to the Committee. interesting discussion on another forum you might be able to help with. It is not uncommon practice during competitive rounds in club competitions that one guy marks all the score cards including his own. After the round one of his fellow competitors signs his card as marker. Is there a breach of rule here? If there is are all competitors in that group in breach or only the guy who has all the score cards during the round? The wording in the rule (6-6 a & b) is not unambiguous. It makes a distinction between during the round and after the round and carefully uses words like 'should' and 'must'. It leaves room for interpretation whether a marker is merely the guy who stands over another competitor's score or whether he must be the guy who actually writes the score onto the card during the round. "I have one final point on this subject. In some playing groups it is common for one person to mark all the scorecards, including their own. This is not an acceptable practice in competitions and must be discouraged." You will gather from this that there is no Rule of Golf that penalises one player in a group from marking all the score cards, including their own. However, I recommend that Committees introduce sanctions against players who do this, e.g. suspending the player from entering the next competition. It is a bad practice and one which obviously goes against the implied intention of Rule 6-6. Thanks very much for that. Maybe the rule should be clearer on this. As much the game is about integrity, my question is more to do with controlling false reporting of scores, marker & player colluding, player changing his scorecard after marker has signed etc. Are there any measures in your experience that a committee could adopt to control this ? Committees should encourage members who have any evidence, or even suspicions, of the type of incidents that you describe to report the details to them. They should make it very clear that any false reporting of gross scores will be taken extremely seriously and an offending player will be suspended from playing on the course for a significant period of time. It is totally unacceptable that any member falsifies their score, as this affects the rights of every other competitor. As you say, golf is a game of utmost integrity and the Committee must take every measure available to them to ensure that this is understood by all members. In my experience, it only takes one player to be suspended, for say a year's play, for other members to take their responsibility for accurate scoring, both as players and markers, more seriously. what are the precise rules concerning handing in scorecards. If there is a ballot box, is that the official place for returned cards. If an official at the table takes your card before it is put into the box, if the player immediately asks for it back to make an alteration, can the official say that the card cannot be returned as the official has the card even though it is not in the ballot box. Should the official point out any obvious problems with the card. Rule 6-6b is the Rule that deals with competitors returning score cards. It is a duty of the Committee to inform competitors where and to whom to return their score cards. In the circumstance that you describe a card has definitely been returned, and cannot be recovered for alteration purposes, if it has been deposited in the competition box. In my opinion, if the card is handed to a Committee member, or someone that has the authority to receive and check the completed score cards, then the card has been returned. In my opinion, any 'official' may, and should, point out any obvious discrepancy before the player moves away, though there is no responsibility for them to do so. It is a similar situation to a tournament where mistakes may be corrected until the player has left the 'score card returning area'. Earlier this week I played in a Ladies open - the format was AM-AM, 4 players in a team with the best 2 score to count on each hole. All scores were recorded against the correct players but on the penultimate hole I marked a score as 6 for 2 points when it should have been 5 for 2 points. The error was found when the card was checked and we were disqualified for signing for an incorrect score. As we signed for a higher gross score than taken I do not think that this was correct. Can you confirm? The disqualification ruling was incorrect. The Committee should have accepted the higher score recorded on the card of 6, presumably for 1 point. No, and in my opinion any player that does so should be severely reprimanded/sanctioned by the Committee. If a player has any doubt about a score card returned by another competitor they should address their concern to the Committee and let them deal with it. can someone NOT IN COMPETITION mark a card for someone actually in a club competition? There is nothing in the Rules of Golf that prohibits this. However, as a marker is someone who is appointed the Committee to record a competitor's score, it is advisable to check with the Committee first. For example, I am aware that some Clubs have a condition of competition that requires a marker to be someone who has an official handicap, and others that do not permit juniors to act as a marker for a full member. Rule 6-6b states that your card must be returned 'as soon as possible'. However, our group usually inputs the scores in the computer before taking them into the bar. We have our own private individual, blind pairs and team competition for a few quid using our competition cards for the day. We then put our cards in the competition box before leaving the clubhouse to go home. This has recently been questioned and I noticed that another member was disqualified for taking his card into the bar before posting it in the competition box. What does 'as soon as possible' mean and can you clarify whether you can be disqualified for not posting your card as soon as you leave the course. What can I say? As you say, Rule 6-6b states that your card must be returned 'as soon as possible'. Taking a score card into the bar and not returning them to the competition box until you leave for home obviously does not meet this requirement and the penalty for a breach of the Rule is disqualification. The fact that the scores have been entered into a computer is not relevant, as the Rules of Golf do not require this (although it may be a Condition of Competition by the Committee who may impose sanctions if players do not comply). We have two boxes next to each other, one for cards and one for money. Recently one of our members accidentally put her card in the wrong box and advised one of the handicap committee immediately. She returned the highest score and a club record but was advised she was disqualified for not returning her card? Is this right? Yes, the disqualification, though harsh, was correct under Rule 6-6. It would be the same if a player accidentally recorded a 4 on her score card when she actually scored 5. It is logical that the Committee can only mark those cards that are returned in the designated place; they should not be expected to chase cards that have not been correctly returned. On the internet I have seen many examples of scorecards supposedly completed correctly. All of these have recommended the tee box used is circled. In competition, is it the responsibility of the player or the committee to mark a scorecard with which tee box was used? I know the committee is supposed to confirm which course the competition is held over i.e. white/yellow/red but who is responsible for marking the scorecard with the appropriate tee box? Or is it simply not a requirement to mark the tee box used? There is no requirement in the Rules of Golf for either the player or the Committee to mark a score card with which tee markers were played from. This probably has something to do with the handicapping system in use. In UK and Ireland, where I play my golf, players rarely identify which teeing ground has been used, as this does not affect their handicaps. Yes, providing she did not play (i.e. practice) on the first day of the competition. There is nothing in the Rules of Golf preventing anyone from knowing, or finding out, the scores of other competitors before they play. I have a question which popped up recently. A 4 ball playing in a singles stapleford competition had their scores marked on one card by one player. They later transcribed their scores on to their individual cards. Players who were not responsible for marking then signed the cards . This was brought to our attention by one of the players involved In the 4 ball who said he regretted signing the card as he could not verify its content. One of the cards was the winning card on the day but was not signed by the player that marked all 4 scores. Should this card have been accepted. I would thank you for any advice you could offer on this matter. In my opinion, the only card(s) that should be accepted was the one signed by both the player and the person that marked all the cards. The other cards did not meet the requirements of Rule 6-6 and the players should be disqualified. I also recommend that the Committee ensures that this incident is notified to members/competitors with a warning that this practice does not meet the Rules of Golf and is not acceptable. Hi... enjoyed all your golf answers. .. brill. It is up to the Committee to appoint a marker. However, Decision 6-6a/1 clarifies that if the Committee failed to provide a marker (which is common in many Club competitions), it should give retrospective authority to the player who acted as the competitor's marker. In my opinion anyone who has a GUI handicap should be acceptable to the Committee. Yes, there is nothing in the Rules that disallows this practice. Similarly, A may mark the three score cards of B, C and D, one of whom must mark A's card. Quick question for you. My wife recently played in an Open, stableford at a course nearby. My wife plays of 21, but for some reason on the top of the card it had her handicap down as 26. She said she meant to change it to 21 but forgot. The following day she received a phone call saying she had been DQ'd as she had played off the wrong handicap. Yes, this was a clear breach of Rule 6-2d, for which the penalty is disqualification. Our Conditions of competition are posted in the locker room and clearly state that scores must be entered in the computer. In a recent Fourball competition one card was not entered in the computer but just returned to the box. Competition was ended and results posted. The pairing that put their scorecard in the box realised they had a winning score so contacted the competition secretary. The competition was reopened on the computer and their score was input and results were amended. My question is was this correct or should the pairing have been dq'd for not adhering to the Conditions of Competition. "a Committee may not, as a condition of competition, require that competitors must enter their scores into a computer and so players cannot be penalised for failing to do so )Decision 6-6b/8)." In a team event such as a team of 3, best 2 scores to count on each hole, where the team mark their own card, is it acceptable under the rules for just the marker to sign the card, without one other member of the team signing to verify the score. The Rules of Golf do not cover team formats, so this matter should be included in the Conditions of Competition. However, following the principles in the Rules, it is my opinion that the score card should definitely be signed by two team members, as this is required under all the stroke play formats that are covered by the Rules. I recently competed in a stroke event at my local club. It appears I did not sign my card prior to placing it in the box. I was present in the clubhouse as the match committee checked the cards. No one on match committee notified me that I had not signed my card. Understand they don't have too, but they could have. There was no way for me to find out that I had been disqualified. Do the match committee have some responsibility to inform the player at all? How am I meant to know that I have been disqualified? The requirement for a player (and their marker) to sign their score card before returning it to the Committee is a Rule of Golf. Breaching this Rule 6-6b incurs the penalty of disqualification. As with any other breach of Rule of Golf no exception should be made by the Committee, otherwise any player that incurred a penalty could approach the Committee quoting exceptional circumstances for their breach. The Committee does not have any responsibility to inform the player of their disqualification before the results are announced, though in my experience most Committees would choose to do so if the player was easily contactable. It is probably not of any comfort to you, but players who are disqualified for returning an incomplete score card (e.g. missing their signature, their marker's signature, full handicap) are subsequently so careful that they never incur the penalty again. My Club Committee has a set of rules concerning Card Completion. They say if you don't fill in your card with all the information they request including as example the Name of the Competition and date you will be disqualified. The only exception is if you fail to enter the card in the computer when they will take disciplinary action. Can the y disqualify you for the two examples I mention? I know they can if you don't sign, don't put gross scores and don't put handicap. The Conditions of Competition that you describe are not permitted by the Rules of Golf. The Committee may impose internal sanctions, but in my opinion this would be unusual and heavy-handed, especially as it is their duty under Rule 33-5 to provide the players with their score cards containing the date and their name. Hi Barry, can a player remove his/her completed card for adjustment or correction from the box provided by the match committee. Hi. Myself and my partner turned up to play in a 4 ball better ball comp.On the first tee we were informed that our partners had not turned up. so we asked for a marker. they informed us there was no one to come out and mark our card. but said we could still play and mark our own card, so we played and handed the finished card to the professional who was running the open comp.and after telling us both to sign it our score was posted on the leaderboard. is this allowed in the rules of golf. No. Rule 6-6a requires that at least one marker must sign the completed score card. The marker may not be a member of the four-ball side. Apologies for the delay in replying; your comment got lost! Q. Rule 6-6c prohibits alterations to the score card "after the competitor has returned it to the Committee." When is a score card considered returned? I am just wondering are the management committee allowed to come out on the course and ask to see someone's scorecard mid round? I was recently playing in my club's President's Prize. While I played the 14th the President appeared at the green and then approached my playing partner. After I holed out my partner told me that the President had asked to see my score card, my playing partner refused to show it and then was asked what score I had on the front 9 which my partner also refused to disclose. We were the last pair out & I think she was being nosy as I'm a relatively new member but have won a few majors. I am just looking to clarify whether or not they can do this. There is nothing in the Rules that prevents anyone from asking a competitor their score. Similarly, there is nothing in the Rules that states that in stroke play a player is required to give their score to anyone that asks for it, except that the competitor must inform their marker as soon as any penalty is incurred and must confirm their gross score for each hole to the marker as it is completed. In my opinion, it would be poor etiquette for anyone outside of the player's own group to interrupt their round to ascertain their score, in the circumstance that you describe, although I am aware that some Committee members might check the players scores in the last few groups to see if any of them have a score that could be in the prizes, so as to inform others that may have played earlier in the day that they should attend to receive a prize, or not. I would like to know if a caddy is allowed to mark the score of the player and that of his fellow player. If the Committee has not appointed a marker then anyone that is acceptable to the Committee may act as marker. Some Conditions of Competition may restrict who may act as a marker, e.g. they must have an official handicap, or they cannot be a junior. In the scenario where a player partner (marker) needs to leave the course early (i.e after 6 holes)and another player marks the remaining holes, what is the rule? My understanding is that each marker must sign the card for the holes that they are responsible for? Would they also be in breach of the rules 6.6b as they did not settle any doubtful points with the committee before signing the card ? Is there a rule against members of the same family marking each other's cards? A marker is one who is appointed by the Committee to record a competitor's score in stroke play. If the Committee has not appointed a marker they should give retrospective authority to the player who acted as the competitor's marker. However, Committees may have a Condition of Competition that limits who may act as a marker, e.g. they must have a recognised handicap, or they must be of a certain age. Decision 6-2b/0.5 that I referred to in the blog above, clarifies that players must record their full handicaps on their score card in any stroke play competition that is being played according to the Rules of Golf. It is the Committee's responsibility to apply the condition of competition to adjust the handicaps. The marker has to be someone that is acceptable to the Committee. I am aware that some Committees put a restriction on who may act as a marker in competition, e.g. they must have a recognised handicap, or they must not be a juinior member. In a 4BBB Comp, we were disqualified under rule 6-6(d), because on a par 5 my partner achieved a par marked in column A as a 5 and while I understand not necessary a score of 3 was marked as the stableford score. All the rest of the card was fine and I signed for a card of 35 which included the above par 5. But the reason they gave the disqualification there was a number 4 marked in column B on the same hole. Have we any right to appeal? If neither you or your partner scored 4 on the hole the Committee was correct in disqualifying you under Rule 6-6d. What is the ruling for a player who doesn't return his card at all! Signs into the competition but no card returned. Obviously, the player is disqualified for not returning a signed score card showing the gross scores for each hole! I suspect that you may be asking this question with regard to how it affects the player's handicap. Unfortunately, unlike the Rules of Golf, handicapping systems vary considerably around the world and I have no experience in this area. You should refer to the handicapping manual for your country. Also, sometimes Committees introduce a Condition of Competition relating to score cards that are not returned, but these involve sanctions (e.g. suspension from the next competition) rather than penalties under the Rules of Golf. In my club, we have so-called split competitions to facilitate people who work. You mentioned that a person cannot 'practise' on the first day of the competition and then compete on the second day... in my case the split competitions are saturday and wednesday... does that mean that a player cannot practise ANY of the days (Sat, Sun, Mon, Tues) or only when the competition is 'active'. In this circumstance the Committee should introduce a Condition of Competition permitting practice on the course between rounds of the stroke-play competition, as per the Note to Rule 7-1b. In my opinion these 'split day' competitions should be discouraged, as it is likely that the hole and teeing ground positions will have been changed and the weather conditions may be significantly different. many thanks for the clarification. The club in question endeavours to keep the tees and holes in the same position but as you rightly said, the climate conditions change quite considerably. We were informed by our committee that the practise of split competitions was highly recommended and to be encouraged by the ILGU.... Thank-you. The person who marked all the score cards did not breach any Rule of Golf, providing a marker subsequently signed his own score card, attesting that they agreed with his gross scores on each hole. However, this is a practice that Committees should discourage, perhaps with a condition of competition that imposes a sanction for not exchanging cards, and in any case individual players should insist that score cards are exchanged before the round commences. Can you sign your card before you exchange cards. Yes, but No! The Rules do not specifically state when a score card must be signed by a player, though the obvious implication is that they should do so after the completion of their round, as the player's signature attests their gross score for each hole. So, a Committee cannot penalise a player who signs their card before completion, but they may introduce a Club Regulation with a sanction (e.g. suspension from the next competition), should they wish. It is a bad practice and should definitely be discouraged. I recently played a stableford in a 3 ball we exchanged card and I marked the card of player A (the only name on card) I put player As score in column A and my own score in markers column. As a check I also put the third players score in column D. After completing the stableford player A and I signed the card and put completed card on the computer and then in the designated box. A few days later the competition secretary informed me that I should not have put down player D score as that was confusing and she was not sure which score had been signed for. Did I break a golf rule? In the circumstance that you describe no Rule of Golf was broken, presuming A's handicap was on the score card, which was valid because it contained A's gross scores for the round and was signed by A, and you as marker. Any other writing on the card is not relevant to the Committee. In fact, the practice you describe is common amongst many golfers. We recently played a team scramble and the cards were provided with the team names on the card, but no handicaps. The format was 9/10's of your full handicap. I had a few mates that had a decent score but I found out later they hadn't put their handicaps on the card and were disqualified. As far as I can see the Rule 6-2b applies, even thought that rule doesn't specifically stipulate stableford or team competitions under that rule. Who's right? It is a requirement of any competitive golf that is played to USGA/R&A Rules that players' full handicaps are recorded on their score cards. The penalty for not doing so is disqualification. There is no direct ruling on this circumstance, which arises from a format not recognised by the Rules. In my opinion, Decision 6-6d/4 suggests that the Committee may accept this score card, though it can be argued either way. "Administrative errors of this specific nature are not contemplated by the Rules and the Committee should correct such an error." Nothing is laid down in the Rules of Golf as to how alterations should be made on a score card. The important point is that the player's score for each hole is legible to the Committee. If the Committee has trouble deciphering any gross score for a hole they should get clarification from the player. A Fourball Stableford competition is played as a qualifier for a Fourball Matchplay knockout competition through the summer. Both players in a pair enter the competition and pay their entry fees. Player B never turns up to play, although his name is written on the card by player A, but no handicap. Player A turns in a good score above the qualifying limit. The card is disqualified as no handicap is written on the card for Player B. Is this correct? The player should not have been disqualified. Part of Rule 31-2 states, "A side may be represented by either partner for all or any part of a stipulated round". There was obviously no scores entered by player B, so A's gross scores, adjusted by the handicap, were the scores for the four-ball that the Committee should have accepted. when playing a par event is the gross hole score needed on a card or simply a + or - or a wipe? In all formats of stroke play golf it is the player's gross score that is required against each hole. If there is no score entered for the hole the Committee must assume that the hole was not completed. It is the responsibility of the Committee to determine the points, or in this case whether the hole was won, halved, or lost, although it obviously assists the Committee if the player/marker inputs this information. Quick one does a player have to mark his own score on the card which says markers score. The only scorecard that matters is the player's own scorecard. If they signed that card for a 4 on a hole where they scored 5 they are disqualified.